COMP Cams Spring ID Locators Locator Thickness:.60"
Old standard shims will not hold up to the extreme spring pressures & high RPM of today's race engines. Comp Cams offers a simple, effective solution to the problem. 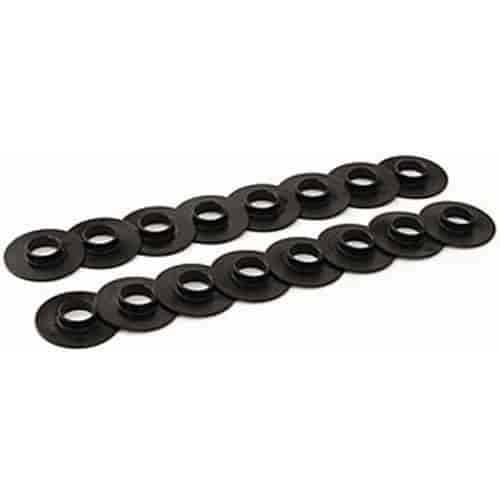 These valve spring locators provide a thin, hardened steel alloy seat that locates and holds the spring in place while protecting the head and shim. Previously this part had only been available in a cup form with the retaining portion on the outside, which required the head to be machined a great deal to accept the cup. Comp Cams has an ID locator with the locating shoulder on the inside, as well as the spring cup. Spring ID locators can usally be installed without machine work.